This is not a food blog (but here’s something about Pasta) – very much alive. I hate cooking, I’m a bad cook, I don’t care about fanciness of my food, and I’m definitely not a foodie (although I enjoy good food when I don’t have to prepare it myself). I usually just cook food that is prepared quickly, eat it so I don’t feel hungry anymore, sigh because I need to wash the dishes, and that’s it. Yesterday though, for the first time in decades, I felt like I really wanted to cook. I almost felt an urge to cook, which is an entirely new feeling for me and I’m not sure how to deal with that yet. 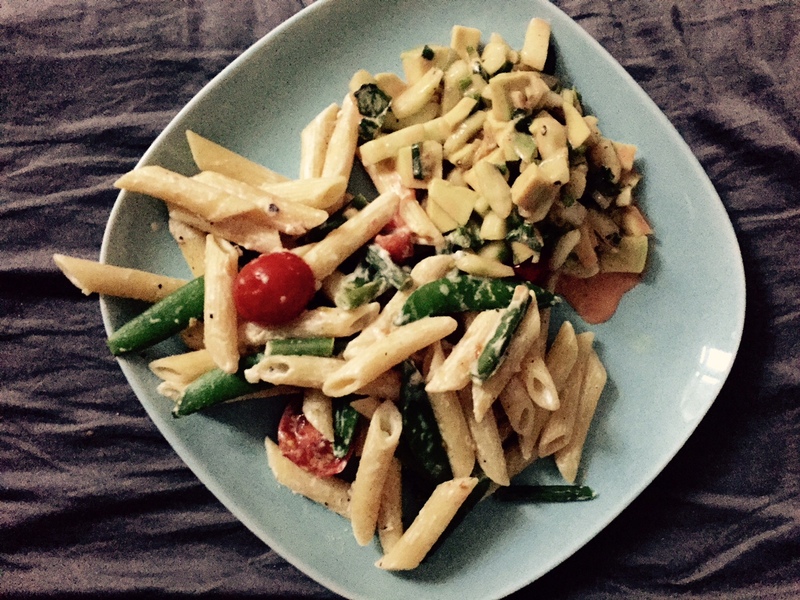 Pasta with sugar snaps, cocktail tomatoes, green beans and Avocado Cucumber Salad. First, I prepared the salad. It’s this recipe, – you basically just dice avocado (make sure it’s really ripe) and cucumber, prepare the dressing, done. I just tweaked the dressing a little – I used yoghurt instead of the mayonnaise, and basil instead of cilantro / parsley. That salad is prepared easily and can just be set aside. It tastes super fresh and creamy, and I also really liked the hot sauce part about it. In case you fancy cheese, you may want to add some parmesan as well. I cooked some Pasta (Penne) al dente. Meanwhile, I cut green beans to the length of the Penne (for the looks), cooked them in water for ~7 mins, set them aside. I washed the sugar snaps and cut the cocktail tomatoes in halfs, and set them all aside as well. And I cut the garlic in very very tiny dices. When the pasta was done, I left some water in the pot, added the cream cheese and garlic, some pepper and salt, stirred it all, had it cook a little more until the sauce was thickening, added all veggies and served it with the salad. I liked this dish a lot. It doesn’t require a lot of special stuff, tastes very fresh, it’s also a little creamy, and has a lot of veggies in it.